The Korean drama remake of the 2011 Qing dynasty drama Bu Bu Jing Xin <步步驚心>, also known as Scarlet Heart, finally made its debut this week on the Korean broadcaster SBS. The remake, titled Moon Lovers: Scarlet Heart Ryeo <月之戀人—步步驚心 麗>, premiered on August 29, 2016 on SBS as part of the channel’s new Monday-Tuesday prime time lineup. The first episode received a rating of 7.4 percent, while the second episode received a higher 9.3 percent, debuting at number three. Moon Lovers’ prime time competitors include KBS2’s Love in the Moonlight and MBC’s Monster. Love in the Moonlight stayed strong with a 16 percent viewership rating, reaching number one. It is then followed by Monster, which obtained a rating of 10 percent. Moon Lovers, adapted from Bu Bu Jing Xin, changes the Qing Dynasty backdrop to Korea’s Goryeo Dynasty. 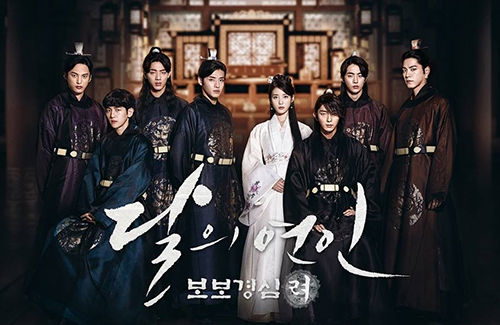 It stars singer IU as Hae Soo, a 21st century woman who gets transported back in time to the reign of King Taejo in the early 900s. She befriends Taejo’s sons, including Wang So (Lee Joon-gi) and Wang Wook (Kang Ha-neul), and gets intertwined in an intricate triangle relationship with them. Reactions toward Moon Lovers have been mixed. While netizens gave a favorable nod to the star-studded drama and praised Lee Joon-gi’s performance, the rest of the cast received criticism for their weak acting. @coralie LJG is surprisingly excellent! I wasn’t sure in the beginning when he was cast as the 4th prince, as he is such a pretty boy but man was I wrong!! Always knew he is a good actor but didn’t know he could pull off an emperor role. I haven’t watch Moon Drawn by Clouds as I have a feeling it’s going to be sad. but KYJ is an excellent actress!! So young, beautiful and talented! I have not watched PBG in a drama before as didn’t watch the Reply drama he was in so don’t know much about him. It can wait as currently obsessed with W – Two World! LJS is awesome!!! With that said, yes, I too think the male lead Park Bo-Gum for Moon Drawn By Clouds/Love in Moonlight does look a bit girly especially ’cause his lips are so pink hahaa. But! But! He also pulls off the manly role very well, in spite of those girly attributes. I know this drama will be a bit sad, but in comparison to Scarlet Heart, which is also tragic & dark, I think this one would be less sad but probably still heart-breaking cus i’m so in love with the characters. I really appreciate the fact that MDBC is so light-hearted in the first few episodes though. It’s like easy breezy and beautiful. I especially like the trope and theme of the whole cross-dressing thing. Time traveling is also one of my fav subjects of all time, but since I already saw Scarlet Heart, I already know what’s going to happen. Side note – this is why Go Princess Go was such a win for me! Both cross-dressing (sorta) & time travel in one! @coralie I love time traveling and cross dressing drama.. Have you watched Queen In Hyun’s Man? It’s a time traveling drama and It’s excellent!!!! I also love pretty boy just wasn’t sure how it’ll go as a king but LJK really is really pulling it off. He is very charismatic!! Think Moon drawn by cloud is going to be sad as PBG is the king so not sure if he’ll end up with KYJ. I’m not a fan of sad drama so this will need to wait before I try it out. Need to finish all the KDrama I’m currently watching too! @went he is a pretty boy but he’s pulling off the character. He is very alluring on screen. I’m actually surprised by the low rating as Korean enjoy watching historical drama and this one have a lot of eye candies! I also love Ji Soo! @coralie watch it when you have time as it is good. Rooftop Prince is another good time travel kdrama. For cross dressing one you need to watch Sungkyunkwan Scandal. All 3 of these drama are wicked funny. The problem with following a drama. The waiting is brutal but its worth it when it’s good!! @happybi Oooh are you a fan of Park Yoo Chun lol, he’s in 2 of your recs. I will check out Sungkyunkwan Scandal, sounds like something up my alley. @coralie Not a crazy fan of PYC but he is a good actor and some of the drama he was in are pretty good. So you could say I like him as an actor. He’s wicked funny in Rooftop prince and his 3 helper in that drama is LOL funny!!!!. Watch that too if you have time. I’m actually a Yoo Ah In fan and he’s in S.Scandal!! Read recap of ep 1 and seems like a mish mash between BBJX (its namesake) and that dastardly cheapo pirated ver, is it Palace? Yeah Palace. The storyline sounds like typical K drama; overly dramatic. I feel nothing for goryeo. Why I love BBJX is because it is about an emperor who I read a lot, I admire and is very controversial. Hence the drama. This one… sorry to say but it is pure drama like prince wearing mask lar, called a dog lar, and what nots. But they are closed to their roles’ age. However i am BBJX forever.